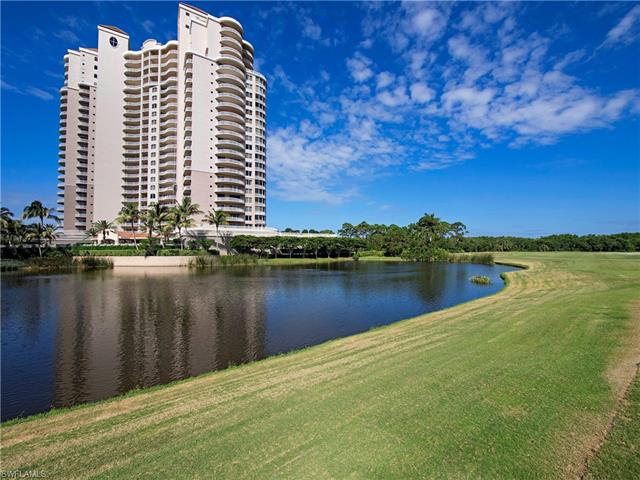 C.15457 - Owners of this luxury condo enjoy private bay and golf course views with no other high rises in sight. Horizon’s perfect location almost on top of Estero Bay, and the 7th floor, means you can watch wildlife over the bay and still enjoy amazing sunrises and sunsets at the beginning and end of each day. The clever split bedroom floorplan allows you and your guests to enjoy privacy with ensuite baths and walk-in closets. The warmth and livability of this home is accentuated with the beautiful wooden floors. A custom executive study offers ample work space and great storage. Master bath includes his/her vanities, his/her walk-in closets and a whirlpool tub with sunset views. The residence also has two large lanais, one screened with electric shutters. 2 under building parking spaces and storage unit. Stately Horizons adds fitness room, heated pool, whirlpool, social room, card room, massage room, saunas and 2 guest suites downstairs for your extra guests. This home presents excellent value and care-free living in beautiful Bonita Bay. We can help match you with “The Best Florida REALTOR®” to buy or sell Bonita Bay real estate, please contact us directly.